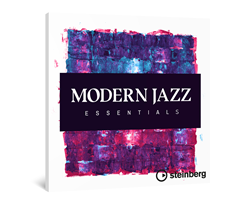 “Modern Jazz Essentials perfectly complements the countless expansion libraries meanwhile offered by Steinberg,” said Florian Haack, senior marketing manager at Steinberg. Steinberg announced the immediate availability of the Modern Jazz Essentials expansion set for Groove Agent 4 and Groove Agent SE 4. Modern Jazz Essentials is a Groove Agent expansion set exclusively available through the Steinberg Online Shop for $24.99, shipping included. 10 modern jazz Styles for the Acoustic Agent drum kits in Groove Agent. Each Style is featured in a VST preset, which comes with a dedicated mixer setting. Styles can also be used as MIDI Grooves in your favorite DAW. Grooves cover a range of different tempi and time signatures. Each Style includes main parts, intros, endings, and fills. Easily explore and embrace the subtle nuances of modern jazz drumming. Quickly create sophisticated drum tracks. Inspired by outstanding contemporary jazz artists. An almost infinite resource for creating backing tracks, inspiring new compositions, and improvisation.